Update: US Fish & Wildlife published the final rule designating critical habitat for Franciscan manzanita on December 20, 2013. 230.2 acres of land in San Francisco have been designated as critical habitat: 46.6 acres of federal land, 172.8 acres of parks owned by San Francisco’s Recreation and Parks Department, and 10.8 acres of private land. The complete document is available here. The document responds to public comments and explains any differences between the proposed designation and the final rule. It makes interesting reading. 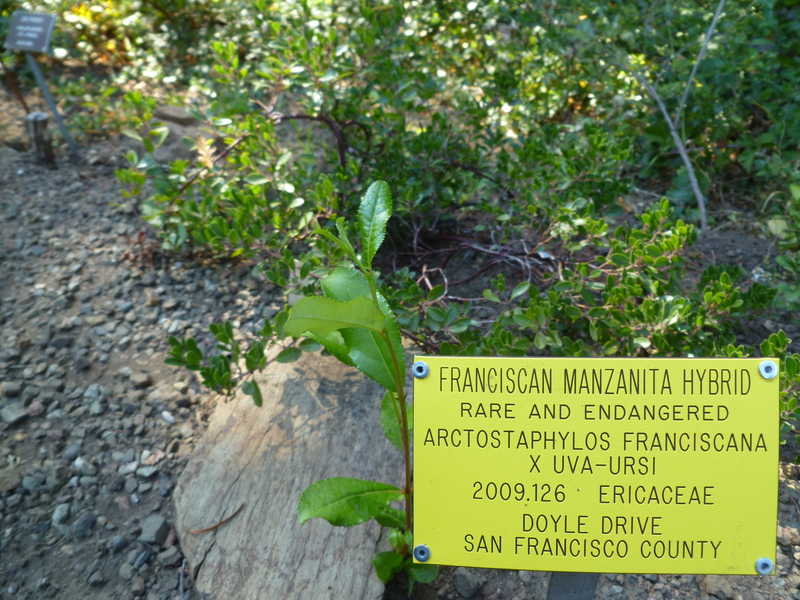 On September 5, 2012, US Fish & Wildlife (USFWS) announced that Franciscan manzanita is now an endangered species. In 2009 the single plant known to exist in the wild was discovered during the reconstruction of Doyle Drive. It was transplanted to an undisclosed location in the Presidio in San Francisco. In addition to the conferral of endangered status, US Fish & Wildlife has designated 318 acres of land in San Francisco as critical habitat for the Franciscan manzanita. Critical habitats are places where the endangered plant is either known to have existed in the past or they are places that provide what the plant needs to survive. There are 96 species of manzanita in California (1). The ranges of most of these species are extremely small because the manzanita hybridizes freely and therefore adaptive radiation has resulted in a multitude of species, sub-species, and varieties that are adapted to micro-climates. Many of these species are locally rare, which is consistent with the fact that 6 species of manzanita have already been designated as endangered, two of which are limited to the San Francisco peninsula: Raven’s manzanita and Franciscan manzanita. The genetic relationship between these two species of manzanita is ambiguous, which is reflected in the constantly shifting opinions of biologists about the taxonomy (species classification) of manzanita. The 2003 Recovery Plan for Raven’s manzanita recounted the long history of these shifting views. For some time, Raven’s and Franciscan manzanitas were considered the same species. Then, for an equally long time, they were considered sub-species of the same species, Arctostaphylos hookeri. It was not until 2007, that Raven’s was reclassified as a sub-species of Arctostaphylos montana. Presently, Franciscan manzanita is classified as its own species, Arctostaphylos franciscana. To add to the confusion regarding the provenance of Franciscan manzanita, some biologists are of the opinion that the individual plant that was discovered on Doyle Drive is actually a hybrid, not a pure-bred Franciscan manzanita. The East Bay Regional Park District botanical garden in Tilden Park has planted a clone of the individual plant from Doyle Drive. It is labeled as a hybrid of Arctostaphylos uva-ursi, which is one of the few species of manzanita with a wide range. This is the label on the “Doyle Drive” manzanita in Tilden Park Botanical Garden, indicating that it is a hybrid. The park ranger who led us to this plant in the Tilden garden, pointed out that the plant is morphologically distinct from the Franciscan manzanita that has been resident in that garden for about 50 years. He expressed his opinion that the Doyle Drive manzanita was properly labeled as a hybrid. Franciscan manzanita has been available for purchase in nurseries for about 50 years. It has been propagated by taking cuttings and therefore they are presumed to be genetically identical clones. However, given that this plant has been sold to the public for a long time, we have no way of knowing exactly where they have been planted or if some have successfully reproduced by germinating seeds. For all we know, this plant is thriving somewhere, perhaps even in a place we might call “wild.” Perhaps the plant found on Doyle Drive was purchased in a nursery! The individual plant found on Doyle Drive has been defined by USFWS as Franciscan manzanita despite the fact that some biologists consider it a hybrid of another species. We understand that the motivation for designating this individual as an endangered species and providing it with critical habitat is based on an assumption that it is genetically different from the Franciscan manzanita that can be purchased in nurseries and that the chances of survival of the species may be improved by cross-fertilization of these two plants such that greater genetic diversity results from their union. Yet we are offered no evidence of the genetic composition of the Doyle Drive individual or Franciscan manzanita sold in nurseries. Nor are we provided any evidence that the Doyle Drive individual is even a genetically “pure” Franciscan manzanita rather than a hybrid of another species altogether. If we weren’t being asked to devote 318 acres of land to the propagation of a plant with such ambiguous taxonomy, we might not question how little information we have been provided. The technology of mapping the genome of this plant is available to us. Why aren’t we making use of this technology to resolve these ambiguities? The cost of planting 318 acres with this endangered plant far exceeds the cost of such genetic analysis. We have already made the point that Raven’s and Franciscan manzanitas are closely related. In its proposal for the designation of critical habitat for Franciscan, USFWS confirms this close relationship by referring us to the Recovery Plan for Raven’s. In other words, the characteristics and horticultural requirements of these two species are so similar that a separate Recovery Plan for Franciscan is not necessary. The Recovery Plan for Raven’s is applicable to Franciscan. Therefore, we should assume that the fate of the recovery effort for Franciscan will be similar to that for the Raven’s. Raven’s was designated as endangered in 1979. Its first recovery plan was published in 1984 and the second in 2003. Many 5-year reviews of its endangered status have been done during this 33 year period. The most recent 5-year review was published in June 2012; that is, very recently. Clones of the single plant in the wild exist in several botanical gardens. These clones are genetically identical and their growth in maintained gardens does not meet ESA standards for recovery. The plant has been the victim of twig blight several times, but the fungus cannot be treated because it would damage the mycorrhizal fungi in the soil upon which the plant is dependent. The seeds depend upon animal predators for dispersal which are largely absent in an urban area. The pollinators of manzanita have not been identified and therefore there is no assurance that they still exist in this location. We can’t appreciate the significance of the utter failure of this effort without some mention of the extreme methods used to overcome these obstacles. The seed of manzanita is germinated by fire. However, the exact relationship between fire and germination is not known. Therefore, many complex experiments have been conducted on the few viable seeds produced by the Raven’s manzanita in a futile effort to determine the winning combination. These experiments are described in detail in an article in Fremontia (1). In short, various combinations of fire, heat, cold, smoke, liquid smoke, etc., were tried and failed to determine exactly what triggers germination of manzanita seeds. Frankly, it is no longer credible to expect the recovery of Raven’s manzanita and this failure implies the same fate for Franciscan manzanita. Can the public parks of San Francisco meet the horticultural requirements of Franciscan manzanita? The public parks of the City of San Francisco cannot meet the horticultural requirements of the Franciscan manzanita because it requires fire to germinate its seeds. All of the critical habitats proposed by USFWS in San Francisco’s public parks are designated “natural areas.” According to the DRAFT Environmental Impact Report of the “Significant Natural Resource Areas Management Plan,” prescribed burns are prohibited in the natural areas. Therefore, unless there are unplanned wildfires in the six public parks proposed as critical habitat, it will not be physically possible to “spontaneously reproduce” this plant, as required by the Endangered Species Act. Granted, the City of San Francisco could revise its management plan for the natural areas to allow—or even require—prescribed burns in the six parks proposed as critical habitat. In that case, the citizens of San Francisco would be subjected to air pollution and risk of causing an uncontrolled wildfire in surrounding residential communities. The Natural Areas Program would be subject to even more criticism than it already endures. The Natural Areas Program is extremely controversial in the City of San Francisco because it destroys healthy non-native trees, it sprays pesticides on non-native vegetation in public areas, it destroys the habitat of wildlife, and it limits the public’s recreational access to trails which are often fenced. Subjecting the natural areas to prescribed burns is surely the bridge too far for the public which would jeopardize the future of the entire program. Why would the City of San Francisco be willing to push the public over the edge by requiring prescribed burns in six urban parks in densely populated residential communities? Furthermore, some of the proposed critical habitat is in heavily forested areas, which are not compatible with the requirement of manzanita for full sun. As they were on behalf of Raven’s manzanita, these trees would be destroyed. The City of San Francisco is already planning to destroy 18,500 trees over 15 feet tall to accommodate its desire to reintroduce native plants to forested areas. (3) How many more trees would need to be destroyed to accommodate Franciscan manzanita? How much more carbon dioxide would be released into the atmosphere by the destroyed trees? Bayview Hill is one of the proposed critical habitats which are heavily forested. According to SNRAMP (3), 17.16 acres of Bayview Hill is forested. Given that Bayview Hill is the only proposed critical habitat which is outside the known historic range of Franciscan manzanita, the loss of 17 acres of trees does not seem a fair trade for a plant with few prospects for survival. The proposed critical habitat in Glen Canyon Park (inaccurately called Diamond Heights by the proposal) is also forested in a portion of the 34 proposed acres of critical habitat. This is a park in which the destruction of trees is being hotly contested. The community in this park does not need the additional controversy of tree destruction for the sole purpose of planting an endangered species. Proposed critical habitat in other city parks is likely to be controversial for other reasons, primarily because additional restrictions on recreational access will undoubtedly be required to protect this endangered plant. Bernal Hill is an example of a city park with a huge community of visitors who will undoubtedly be enraged by further loss of recreational access. They have already been squeezed by the restrictions imposed by the Natural Areas Program. The City of San Francisco is the second most densely populated city in the country. It is comprised of only 29,888 acres. There are only 3,317 acres of City-managed parks in the city. (2) The proposed critical habitat in City-managed parks is 196 acres, 6% of total City-managed park land in San Francisco. Does it make sense for 6% of all City-managed park land to be permanently committed to planting an endangered plant which can be purchased in nurseries? Does it make sense to confiscate 6% of all public parks for a plant the identity of which we are not certain? Does it make sense to throw the public out of 6% of all public parks on behalf of a plant that will never be able to spontaneously reproduce unless there is an accidental wildfire? We think the answers to these questions are no, no, and no. This is an ill-advised proposal which makes a mockery of the Endangered Species Act. This is an important law that is trivialized by a proposal that will be physically impossible to implement without endangering the public and damaging the environment. You seem to have a dislike of imperiled species and are oddly quick to declare them unsavable. Thank goodness cooler heads were in charge of the condor and Mexican gray wolf recovery programs.